🐒 ONLINE USERS AT POLONIEX BITCOIN PRICE correlation I started collecting data on online users at poloniex . I try to collect the data about the same time every day. I was thinking it would be interesting to see how the amount of users increase or decrease with the Bitcoin price . 🐒 SYSTEM # 2 / I may have isolated a possible chart pattern showing the possibility of Bitcoin rising in price . The pattern works like this when Polinex users ( Green Column ) Fall Below 40,000 for the first time after being above 40,000 I can look for a rise in Btc price then exit the trade when Polinex users ( Green Column ) Rise Above The Day You Entered The Trade If the trade is at a loss at this time then wait for the Polinex users ( Green Column ) to Rise back above 40,000 . I have placed a Black # 1 within the column at bottom of chart to show when to enter a BUY and a Black # 2 within the column at bottom of chart to show when to EXIT the trade . 🐒 To date The Bitcoin TRADING SYSTEM # 2 has 7 trades 7 profits and 0 losses for a 100.00% accuracy and $3,467 profit per Bitcoin traded.Below are the results of using this system. Please voice your opinions in the comments below.. 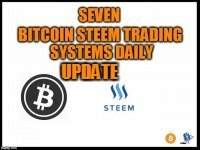 Follow us and vote for witnesses for @mrs.roy or send 0.001SBD with post link in mamo we give you #upvote and #resteem your post to get more upvotes.